5/31/16: Miss Scarlett has an adoption pending, but please see our other African Greys who are available. Update: The lovely and charming Miss Scarlett is back with Mickaboo through no fault of her own. Her person loved her very much, but was not able to care for her anymore. So she is available for adoption again. If you would like to learn more about her please contact her adoption coordinator. 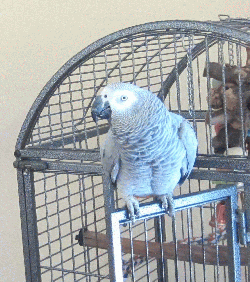 Hi, I`m Miss Scarlett, a lovely 10 year old Congo African Grey. I was adopted through Mickaboo a few years ago; but, sadly, I`m being returned due to illness in my human family. I`m a very nice bird who prefers women, but I speak in a man`s voice. How funny is that! I would like to be adopted into a home where my main caregiver will be a lady. I`m a little wary of men. Maybe something scary happened with a man in my past? Mickaboo is not sure and I`m not telling! I enjoy a healthy diet of pellets and fresh veggies. As you can see from my picture I`m a very pretty girl and my feathers are in perfect condition. If you are looking for a smart and funny companion who will make you smile just click on the link and tell my adoption coordinator that you would like to meet Miss Scarlett!